Roebeck Country Park is a family owned and operated park and set within beautiful rural countryside with views of the Ashey Valley. The park offers a secluded and tranquil location with a private fishing lake stocked with carp and tench (licence is required) and ancient woodland. Parking for Benamara is on the right of the lodge, with four steps that takes you up to the wrap around decking. 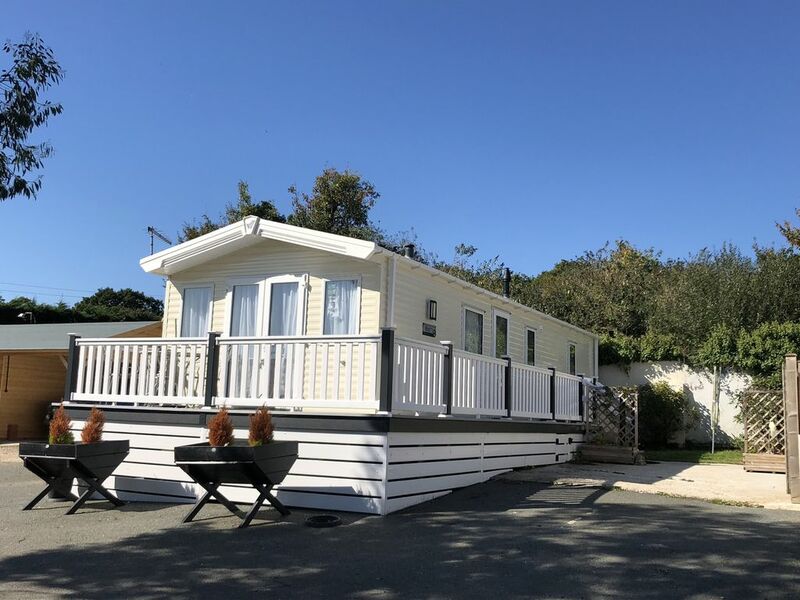 Enter Benamara via the side door, which takes you into the hall and fitted kitchen area, which has been thoughtfully stocked with everything you should need for your family holiday. To the front of the property you will find the spacious sitting and dining areas, with French doors that takes you out onto the decked area with patio furniture and beautiful countryside views. To the rear is the family shower room. Bijoux twin bedroom and master double bedroom with en-suite WC and basin. Outside in-front of your parking area is a small lawned area with an outside clothes dryer. Roebeck Country Park and Benamara are under 3.5 miles from Ryde’s Town Centre, with its marina, boating lake, childrens rides, indoor swimming pool, tennis courts, bowling Greens, as well as having many international restaurants, pubs, cafés, boutiques, and antique shops. Something for everyone. Whilst the 6 miles of golden, gently sloping sandy beaches are ideal for bathing in the summer and breath-taking embracing walks in the winter. There is no better way to start your day, than taking a brisk walk from Ryde to Seaview while watching the sun rise, then pop into a café in Seaview and walk home. Ryde also benefits from having superb transport links therefore no need for a car; the Wightlink Catamaran passenger ferry connects you to the train at the top of the pier, which can take you all the way to Shanklin if desired. The Hover comes over from Southsea, and provided a unique mode of transport, and only takes 10 minutes. Next door to the train station at the bottom of the pier you will find the bus station, with buses waiting to take you all the way around the island. Therefore, making Benamara the perfect base to explore the whole island. As long as you hold a fishing licence, and staying in Benamara you are allowed to fish in the Lakes. No night fishing though. Please enquire about discounted car ferries after your booking has been fully confirmed. Open plan living room, with seating, gas fire, TV. Tea, Coffee, Sugar, Milk and Biscuits. Wrap around balcony with two exits, 1) side door, 2) french doors from the living area.